Our latest weekend project included making several new recipes all at once. So I am going to report each of these as separate entries. 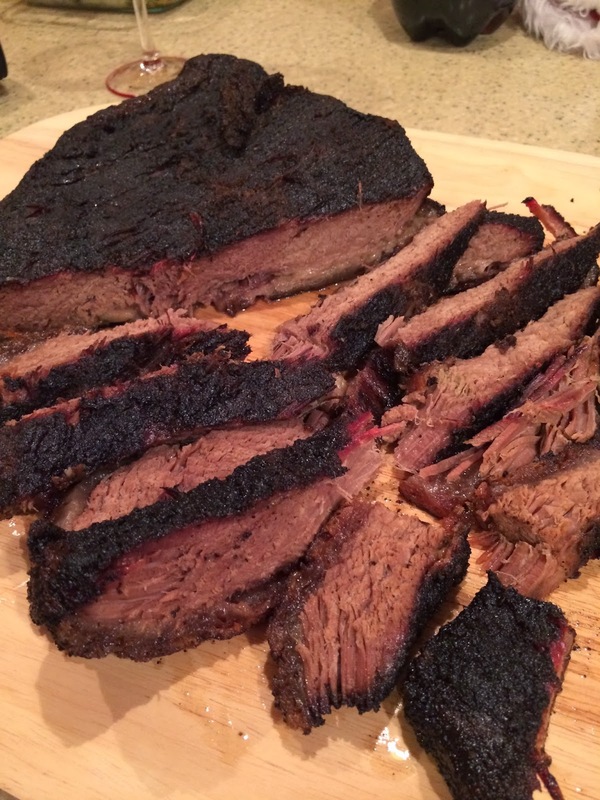 This very first project is near and dear to my heart - Brisket. I am a barbecue fan. I go to a lot of barbecue joints. I think about Aaron Franklin a lot. Note that the various text colors on the page represent updates over time. That was my primary guidance. 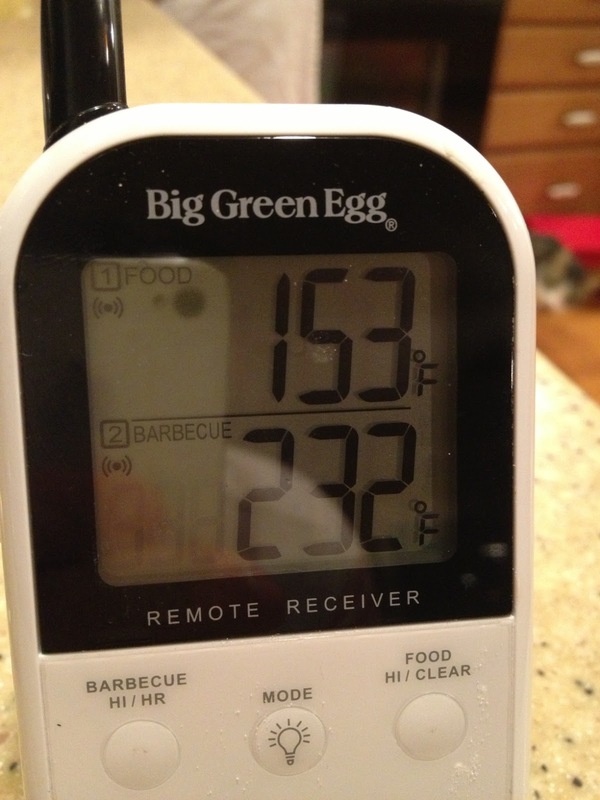 I also did a bunch of research on cooking temperatures both for the Egg and the meat. I relied primarily on barbecue bible to get the temperature information and help me establish my game plan. 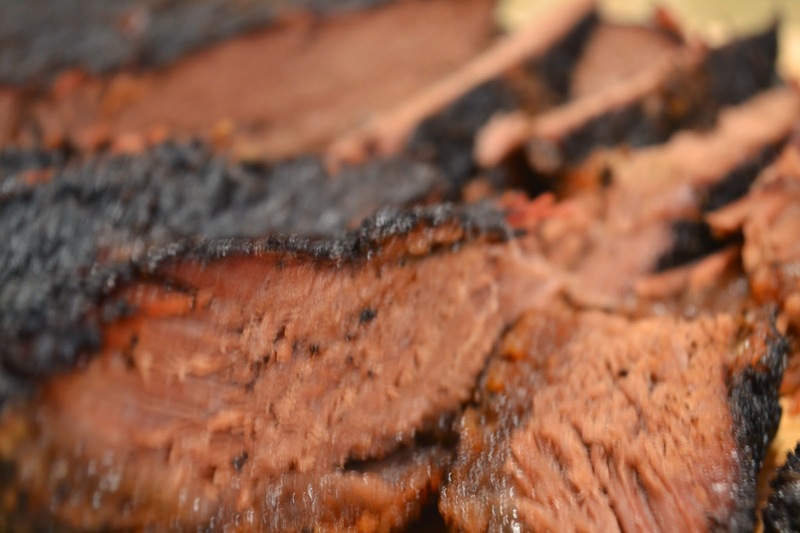 Get a packer cut brisket from the local butcher a day or two before the cook and put it in the fridge. We chose a 13 pounder and spent about $45 for it. 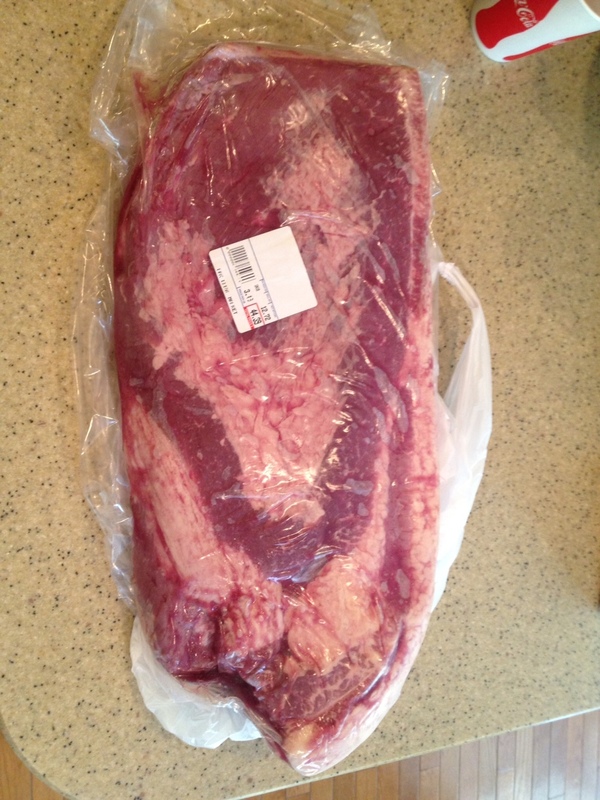 Holy crap, this last 11.5 lb brisket was $90. What happened? Light the Egg at about 8pm the evening before the party and put the brisket on once I get the Egg temperature stabilized at about 240 degrees. Based on what I read, I expect the cook to require somewhere around 1.5 hours per lb, or about 20 hours. 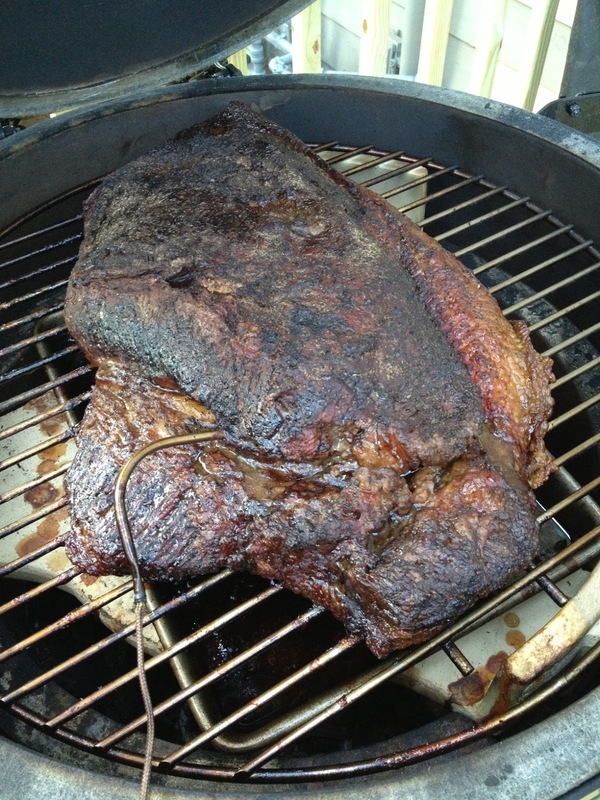 Wrap the brisket with foil when the meat temperature reaches 165 degrees. Continue cooking until the meat reaches 190 degrees and then start checking for tenderness with a fork. Expect to be able to insert the fork into the lean meat and it should feel like going into soft butter. Then turn the fork to see the meat pull apart. 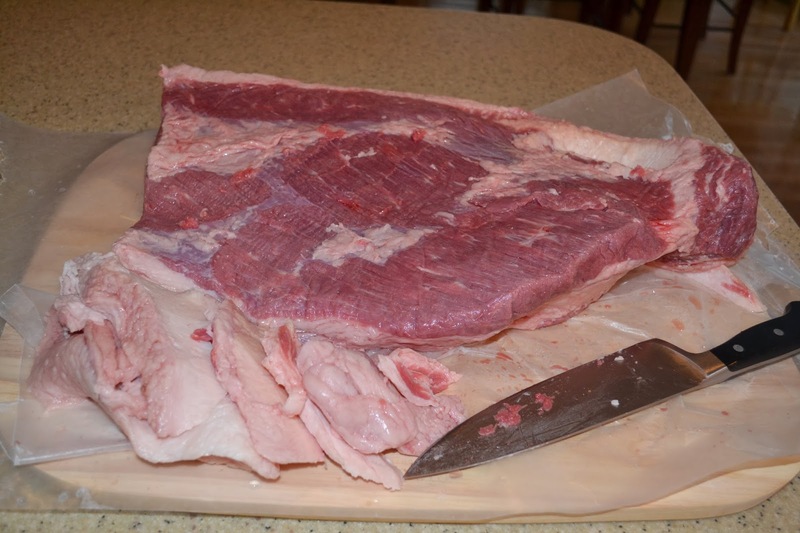 Pull the brisket off the grill, wrap in a towel and place in a cooler to allow the meat to rest for 2 hours. Bring the meat into the kitchen and cut up for serving. 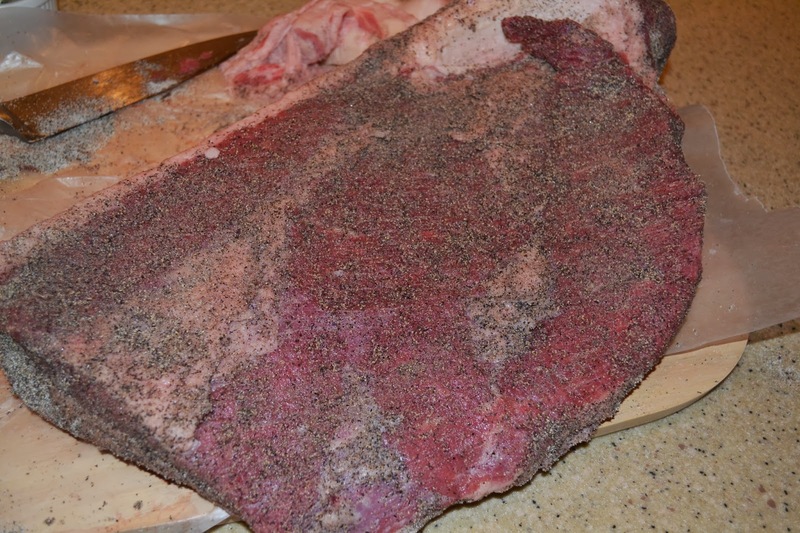 Let the brisket warm for about 2 hours - rubbed with salt and pepper. 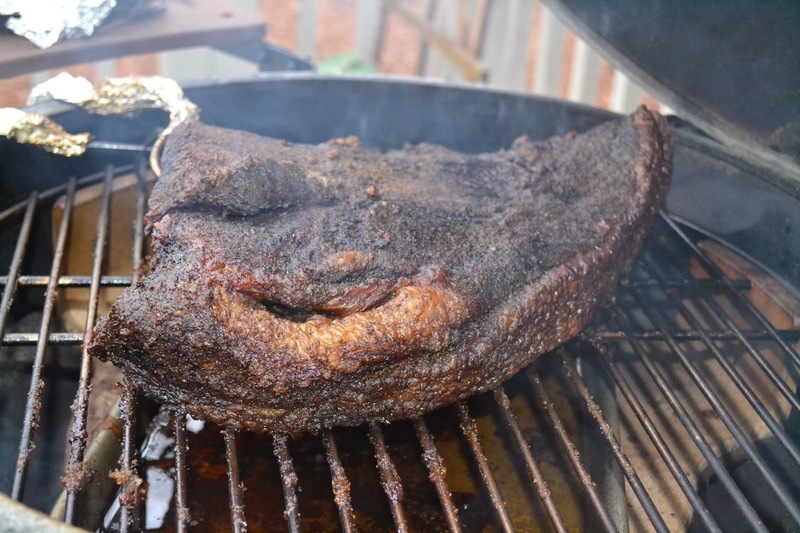 Placed the 10.5 lb brisket (after trimming) on the egg at 5:30pm in hopes that it will be ready at noon the next day. Next time - I'll start it around 9pm. 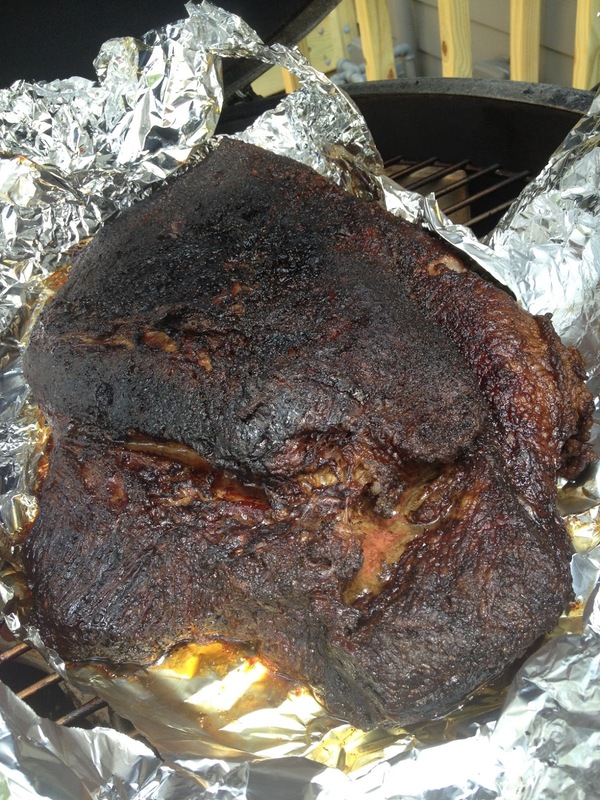 Cooked another 10 lb brisket here are the cook times. Temp remained 250 for the entire cook. Next time.... Start at 11pm - this one wasn't great. Maybe not quite done. Also next time going to cook it a little hotter. I think 270 might be more in line with Franklin. Cooked a 17 pounder a few days ago and this time I used the temperature ramp feature on the digiq. The ramp feature slowly lowers the egg temperature as the meat reaches the set point so that the egg never heats the meat beyond the set point. Put the brisket on at about 5pm and set the meat temperature to 205 and the egg to 270 and just let it go. 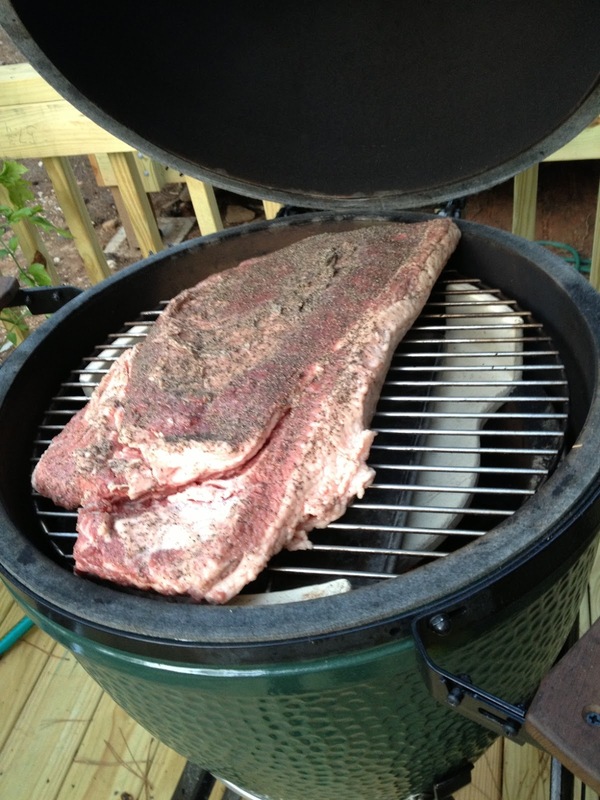 The next morning the brisket was 180ish (the egg ran out of fuel) but not before the brisket reached temperature. This cook was exceptional. I think that I haven't been letting the brisket to the proper temp in an attempt to keep the flat from being too dry. That strategy however wasn't working, just let it get to 205 and don't worry about the flat being too dry. Just realized adding dates to our past updates would have been an awesome idea... oh well. This time we have a 13.5lb USDA Prime whole brisket. Paid $113. DigiQ set to 270 ramp on. Food temp set to 205. 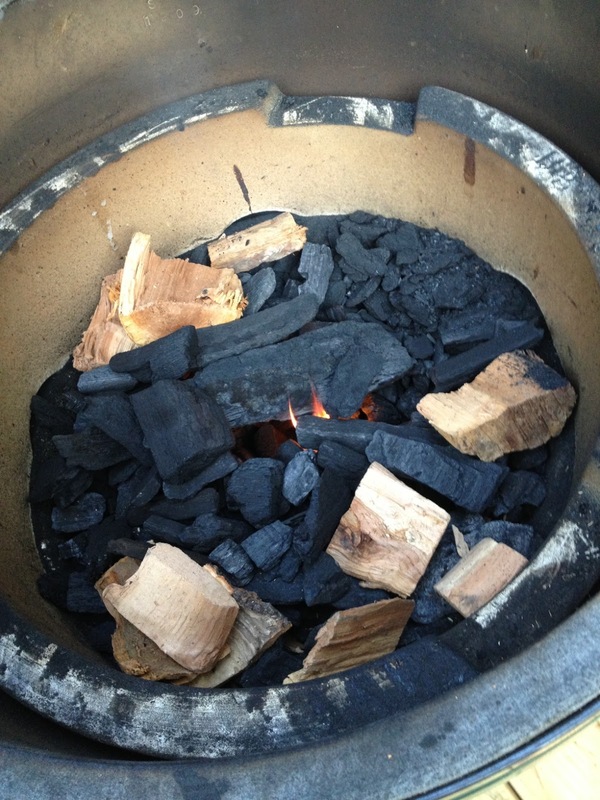 As you can see, I decided to really fill the Egg firebox up with BGE natural lump charcoal. I also included a few chunks of apple tree wood for flavor. I have read debates on soaking the wood versus just placing it in the Egg. I went with the no soak option (didn't have time to soak it, and frankly, it doesn't seem to me that it would make much difference). Once I had a good fire going, I inserted the plate setter, a drip pan and the grate, then closed the lid to warm up the BGE. One of my worries was that I would need to add additional charcoal during the cook, and that is not an easy task when you have the plate setter in place. 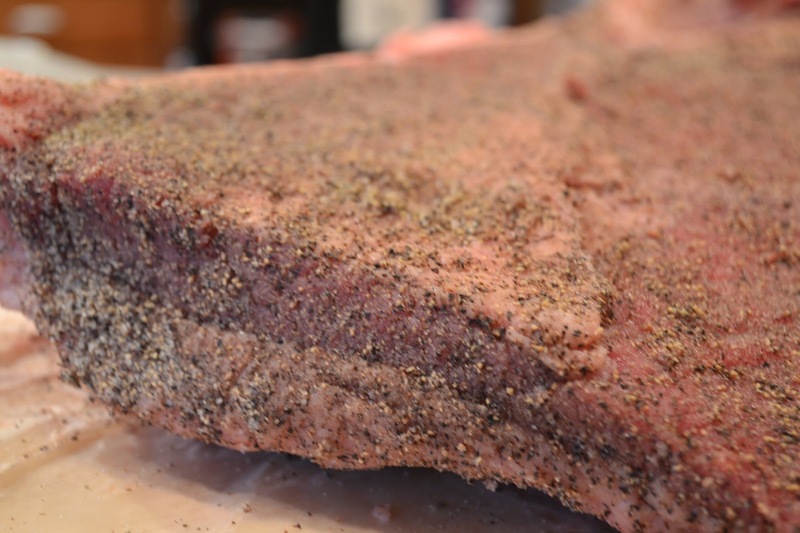 While waiting for the BGE to reach temp, I trimmed some fat off the brisket and rubbed it with salt and pepper just as directed by Aaron Franklin's youtube video. I was a little worried that I didn't trim off as much fat (it was really hard to cut off, and I was afraid I was going to cut my finger off). 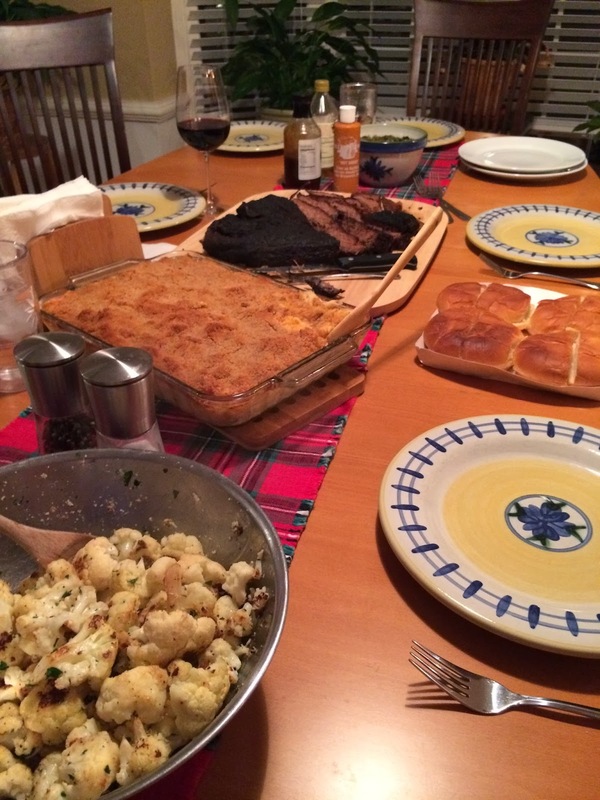 The brisket was cold and messy, and I was using a chef's knife that wasn't the best knife for the job. Once the BGE reached 240 degrees, I closed the lower air intake down to about 1/8" open and the daisy wheel on top fully open. 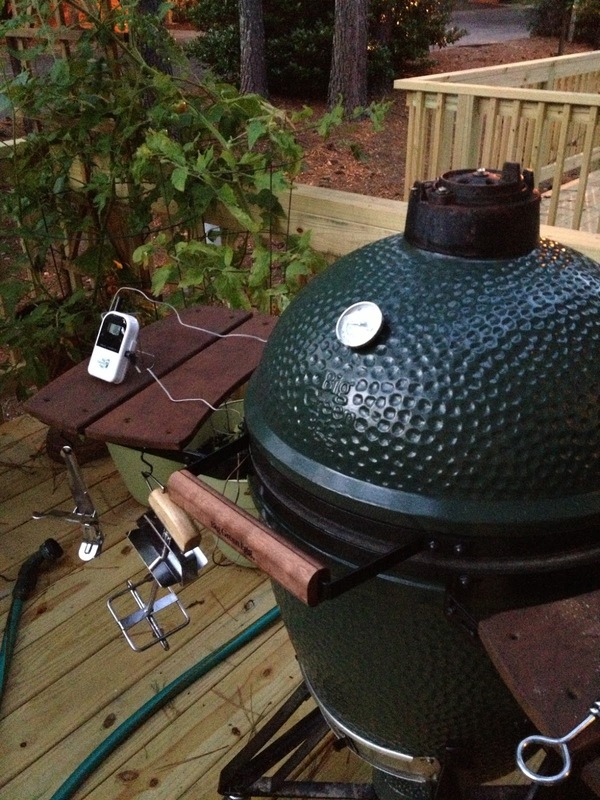 Once the brisket was on the Egg I spent the remainder of the evening setting up the wireless thermometer so that it would alarm if the temperature of the egg exceeded 250 degrees or dropped below 150. Oh, and I also continued drinking a really nice chardonnay. I'm not much of a white wine drinker, but this one was dry and not very sweet and I was excited about the cook. I spent the reminder of the evening tweaking the air intake at the bottom to try and steady the temperature at my 220-240 degree goal. Oh, I also continued to drink the wine. I finally went to bed around 1am having steadied the temperature at 230 degrees or so. My intent was to get up at 3am and then 6am to check the temperature and adjust as necessary. What really happened was that I slept solid until about 7am when I awoke with a start and a mild headache. Panic stricken, I grabbed the remote and realized the BGE temperature dropped to 180 degrees and the food temperature was also at 180 degrees. I jumped up and went downstairs to adjust the bottom intake to open just a little and opened up the BGE to wrap the meat in foil. 7am Saturday morning. Meat temperature 180 degrees. Looking really good. Smelling really good. I was delighted to see the "bark" starting to appear and to note that nothing was burned. I did note that it was still as tough as leather. That was a little scary, but I reminded myself that it still had a long way to go. I spent the remainder of the day obsessing over the meat temperature and the time that everyone was to arrive. We were expecting guests to arrive around 4pm and was planning on serving the brisket around 6pm. When it reached 194 degrees, the meat temperature stopped rising and plateaued for more than 1hr. This was encouraging as I had read about this plateau being the point that the connectivity tissue is breaking down and the meat becomes tender. Just as I read, when the meat passed 196 degrees, I stuck a fork in. 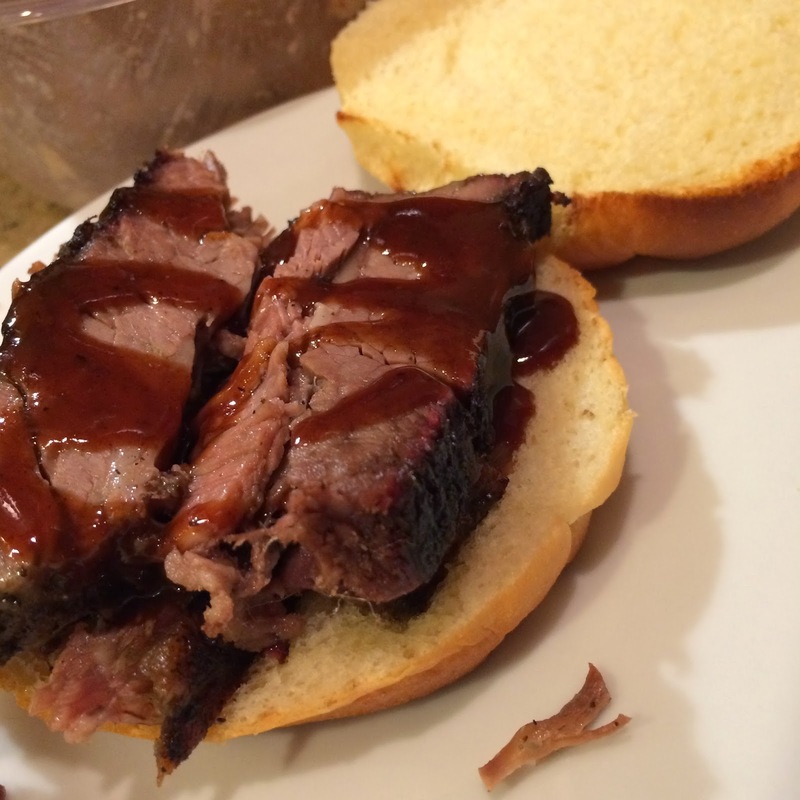 It slid in easily, and when turned, the meat broke open revealing a great smoke ring. I also began checking the meat with an analog meat thermometer and noted that it was measuring a lower temperature, so perhaps my digital temperature gauge was a little hot? I placed the meat in a plastic bag, wrapped it in a towel and placed it in a cooler at about 3pm. It was falling apart as I pulled it off the BGE. Two hours later I pulled out a still very hot brisket out of the cooler, laid it on a wooden cutting board and just pulled it apart with a fork. It was tender and juicy and delicious. It turned out way better than I had hoped. Please make this. It is much simpler to make than I expected. I was really lucky to get the timing right the first time, but actually making it, cooking to temperature and then checking for tenderness is all you need to worry about to get a delicious result.